Those captivated by the smooth vocals of The Weeknd are in for a year-end treat, as the pop star has confirmed that his first concert here will take place in December. In the latest offering of the Hyundai Card Culture Project, which hosts cultural icons in such fields as music, art, dance and architecture, the R&B singer will perform at Gocheok Skydome in Seoul at 7 p.m. on Dec. 15. 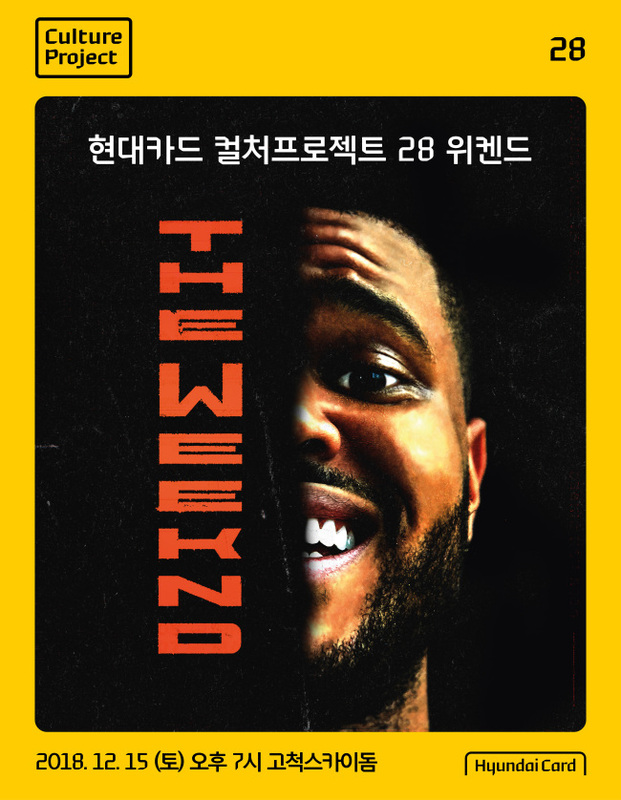 “The Weeknd symbolizes the PBR&B (alternative rhythm and blues) genre of today, which is rising as a trend in popular music worldwide,” an official from Hyundai Card said on why the artist was invited. Tickets for his concert cost between 88,000 won ($78) and 143,000 won, and those paying with a Hyundai Card can receive a 20 percent discount for up to two tickets per person. Online sales of the tickets will open at noon on Aug. 29 via online retailers Interpark and Yes 24, but those with a Hyundai Card membership can do so a day earlier at noon on Aug. 28. The concert is only open to those born before Jan. 1, 2000, and a photo ID is required on entrance. Prior to his official debut, the singer drew attention online after uploading the songs “What You Need,” “Loft Music” and “The Morning” on YouTube. They caught the eye of Canadian megastar Drake, who mentioned them in a blog post, and the singer was eventually covered by several media outlets including the New York Times. Debuted in 2011 with the self-released mixtape “House of Balloons,” the Canadian musician is among the most commercially and critically acclaimed young artists of today. He has three No. 1 albums on Billboard charts -- “Beauty Behind the Madness,” “Starboy” and “My Dear Melancholy” -- along with a number of singles that ranked high on the Hot 100 chart, including “The Hills,” “Can’t Feel My Face,” and “Starboy,” which all peaked at No. 1. All 18 songs of “Starboy” released in 2016 were charted on the Hot 100 upon release. He also has three Grammy Awards under his belt, including those for best urban contemporary album and best R&B performance in 2016.